David tells Solomon to walk in the ways of the Lord and keep his decrees so that he may prosper. He tells Solomon to deal with Joab, Barzillai of Gilead, and Shimei accordingly. Then he died. Adonijah asked Bathsheba to ask Solomon for Abishag to be his wife (David’s concubine). He refused and had Adonijah put to death. Solomon banished Abiathar the priest, killed Joab despite fleeing to the tent of the Lord for protection, and killed Shimei after he disobeyed him and left the city. 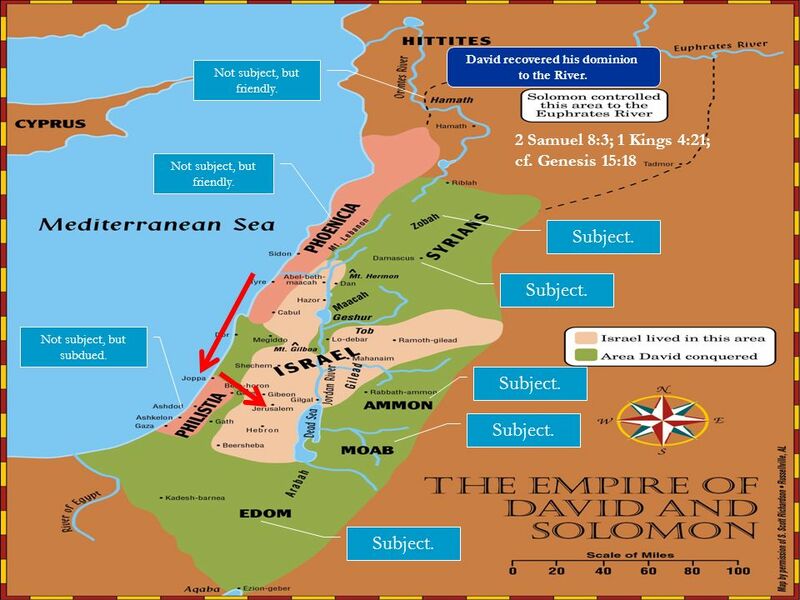 All of Israel celebrated the coronation of King Solomon in place of David. They sacrificed to the Lord and ate and drank. The Lord exalted Solomon and bestowed on him royal splendor as no king in Israel had had before. 12) Be strong, observe God’s ways, keep God’s decrees, commandments, laws, and requirements, and use wisdom with dealing with Joab, Barzillai, and Shimei. 13) Personal Question. My answer. This question is too broad because every situation is different. Mainly if the counsel is good or not in your eyes and God’s. 14) Part personal Question. My answer: Solomon had bestowed on him royal splendor as no king in Israel ever had. God answers in his own time about work to do. God provides way to accomplish His work. A great example of a peaceful transfer of power like in the United States — something very rare in ancient times when battles mostly decided succession. Solomon is set up for success. Be strong and prove yourself a man: The same expression was used by the Philistines in 1 Samuel 4:9 as they encouraged one another in their battle against what they assumed to be insurmountable odds. TAKE AWAY: God promises that if we put Him first, He will take care of the rest. Joab is one of the more complex characters of the Old Testament. He was fiercely loyal to David, yet not strongly obedient. He disobeyed David when he thought it was in David’s best interest, and he was cunning and ruthless in furthering his own position. David didn’t mention Joab’s killing of Absalom, which David commanded him not to do (2 Samuel 18). Perhaps by this time David recognized that Absalom did in fact have to die for his treason and attempted murder against David. David vowed that he would not kill the obnoxious rebel Shimei (2 Samuel 16:5-13 ). It was right for David to keep his vow, but it was also right for him to make sure that Shimei received justice without David breaking his vow. David rested with his fathers, which was a phrase that become common throughout 1 and 2 Kings to describe the passing of a king from this world. Truly, David passed from this life to eternal rest and reward. So ended the earthly life of one of the greatest men ever to walk the earth. So he died in a good old age, full of days and riches and honor. (1 Chronicles 29:28) “Of his adultery and murder we hear not a word, because he had made a thorough peace with God for those sins in his lifetime” (Trapp). The tomb of David was known in the time of Jesus and the apostles, according to Acts 2:29. Afterwards, the Christian writer Jerome speaks of it being known in his time. What is currently known in Jerusalem as David’s Tomb is almost certainly not the genuine one that was known in ancient times. Solomon as king was the fulfillment of the promise made to David in 2 Samuel 7:12-16. That promise was ultimately fulfilled in Jesus, the Son of David; but it also had a definite and partial fulfillment in Solomon. Adonijah had reason to wish revenge on Bathsheba since it was Nathan and Bathsheba who warned King David of Adonijah’s attempt for the throne. In 2 Samuel 16:20-23 Absalom, the brother of Adonijah, asserted his rebellious claim on David’s throne by taking David’s concubines unto himself. Adonijah wants to declare a claim to Solomon’s throne by taking David’s widowed concubine as his wife. Among the ancient Persians and Arabs, the new king took the harem of the previous king. Bathsheba agreed to take Adonijah’s request, so Solomon would know Adonijah was still working against him. Abiathar deserved death because he supported Adonijah as the next king, in defiance of the will of God and the will of King David (1 Kings 1:7). This was treason against both God and the King of Israel. Solomon showed mercy and wisdom to Abiathar by sparing Abiathar’s life because of his past standing as a chief priest and supporter of David. This refers to the prophecies found in 1 Samuel 2:27-36 and 1 Samuel 3:11-14. In removing Abiathar from the priesthood, Solomon, without direct intention, fulfilled the promise of judgment against the house of Eli, made some 100 years before Solomon took the throne. Shimei died out of pure forgetfulness and fault on his part by disobeying Solomon. Solomon’s throne was secure at an early date, not like the reign of David or Saul. Saul and David had faced a measure of suspicion or opposition from their own countrymen; both had met this problem with resolute action, coupled with understanding and leniency. Solomon, however, eliminated his potential enemies swiftly and ruthlessly. David has paved the way for Solomon to have such splendor.